The La Jolla Historical Society of San Diego, California, has announced final plans for a new public garden it has created that will house repurposed elements of the Venturi Scott Brown Associates’ (VSBA) Museum of Contemporary Art San Diego (MCASD) complex. Specifically, the garden will contain one of the two fiberglass and aluminum pergola structures that have been removed from the MCASD complex as part of an increasingly controversial renovation and expansion scheme for the museum by New York City–based Selldorf Architects. The pergola features a dozen rounded, Tuscan-inspired fiberglass columns that support an aluminum trellis designed to evoke a traditional wood pergola. 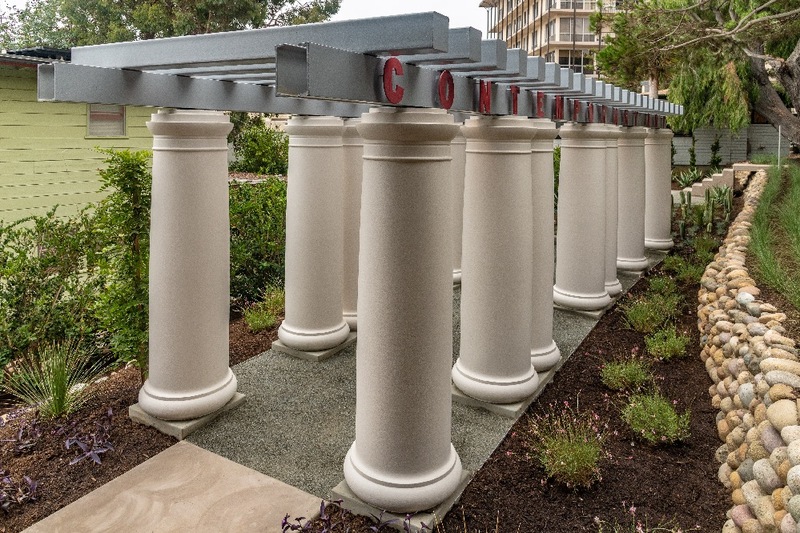 The words “Contemporary Art” are arranged across the horizontal section of the pergola in red capital letters. Originally, the paired structures flanked the north side of the Prospect Street entrance to MCASD to create a pedestrian-oriented seating area at the mouth of the museum where visitors could gather. Only one of the two pergolas was saved from demolition. The pergolas have been cleared away by the Selldorf team in an effort to reorient the building’s main entrance toward a new atrium. Fox added, “The Society [also] recognizes the important historical relationship between VSBA and the work of early 20th-century architect Irving J. Gill,” the designer behind the original portion of the MCASD campus. 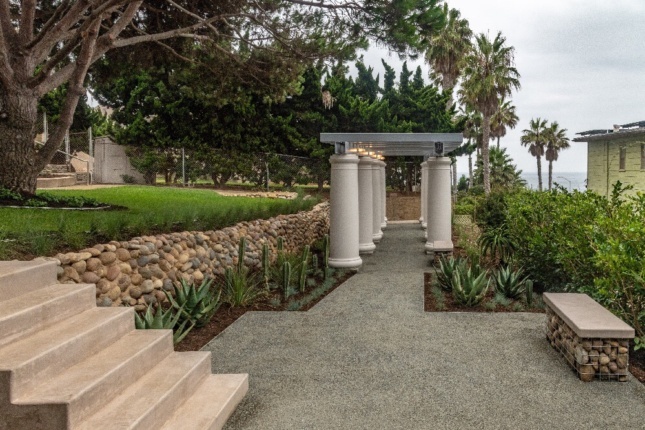 The Society worked with architect Tony Crisafi of Island Architects, structural engineer Matthew Mangano, and landscape architect Greg Hebert to bring the garden to life. 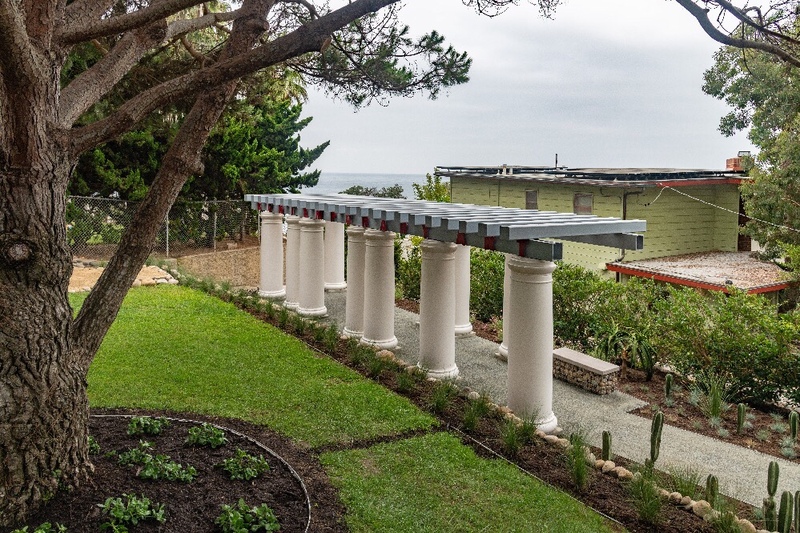 The pergola will now be located in the Society’s lower terrace garden, roughly 300 feet from its original placement and will remain a part of the Scripps-Gill Cultural District. The garden is set to open to the public September 15, 2018.